Co-Op Funds to Reach Your Best Customers - AutoNetTV Media, Inc.
Wouldn’t it be great to always advertise to your best customers? Wouldn’t it be even better if someone else paid for it? Let’s start with the first part: Who are your best customers? Well they’re the ones sitting in your waiting area right now. They’ve already chosen to come to you. They’re planning on spending some money with you today. Can you think of a better audience to tell about the custom wheels you sell, upgraded shocks and struts, or the preventive maintenance services you offer? Talk about the shortest distance between advertisement and cash register. 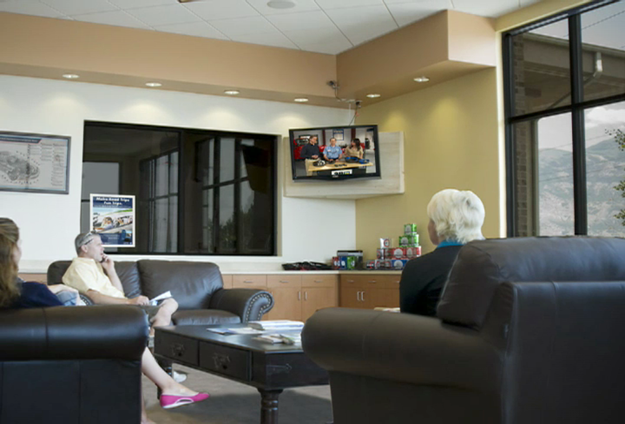 That’s what AutoNetTV ™ does, using the power of television right in your service lobby. But let’s come back to that – first we need to talk about getting someone else to pay for it. You do business with suppliers that offer co-op dollars to market their products. Tire manufacturers, parts suppliers, and oil companies all want to help you grow your business so you’ll buy more from them. If you’re like a lot of automotive center owners, you send those dollars out into the world hoping they bring back some customers. Newspapers, TV, radio, direct mail – they all have their place. But why not use some of those co-op dollars to market to your BEST customers when they’re right in your center with their wallets open. The internet-delivered AutoNetTV Lobby TV program features award-winning automotive segments that educate your customers on various services and motivate them to take care of needed items. Entertainment pieces from REELZ, SPEED, Rachel Ray, CBS, The Doctors, and more are mixed in to make the wait enjoyable, increasing customer satisfaction. You can also include video and other messages from your co-op partners, allowing them to advertise directly to likely customers. AutoNetTV‘s powerful delivery platform gives you the flexibility to easily add your own branding messages, logo, and special promotions right into the TV program. It is the best of both worlds: Advertise your products and services directly to your best customers in an effective, proven program – and get your co-op partners to pay for it. For more information, click to watch a 4 minute video demonstration or give us a call at 877-642-3555.